Robbi and I are excited to be at the beginning of another delightful year of adventures and we feel blessed to be living our passion and to see our dream of sharing the wonderful places, people and experiences that we love continuing to unfold each year. Once again we will be welcoming back a significant number of returning Aroma Travellers who currently make up almost 50% of our guests; which is quite remarkable and something that we are are very grateful for and proud of. This year is all set to be our most successful tour season ever and Robbi and I hope that you will be able to join us. One of the best ways to enjoy the spirit of our Aroma Tours adventures is by taking a peek at a few of the 1000's of photos we have taken during our travels as well as some of beautiful images taken by our guests during their journeys with us. Each year we begin our tour season with a delightful gourmet pilgrimage to northern Spain with our Flavours of Spain Tour. We will journey from Rioja Alavesa, one of the world's premier wine regions, along the legendary pilgrim's path of the Camino de Santiago, to the magnificent coastline of the Bay of Biscay renowned for its beauty and culture and for being home to the highest concentration of Michelin starred fine restaurants in the world. 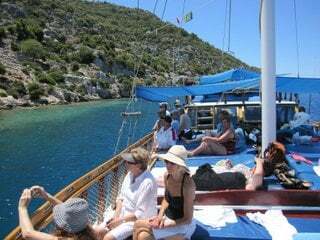 You will experience enchanting villages, glorious seaside vistas, rich culture, stunning architecture, lush vineyards, colourful markets, ancient abbeys, amazing art, beautiful countryside and fascinating historical visits. We have compiled a page of photos of our Flavours of Spain tour for your viewing pleasure and to give you a sense of the wonderful places, experiences, fabulous food and wines that we will enjoying with our guests. Flavours of Spain is fast becoming one of our most popular tours and Robbi and I hope that you will be able to join us next May. 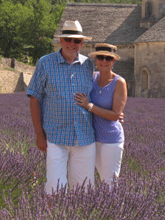 Of all the regions that we visit, Provence has a special place in our hearts. It is where our Aroma Tours began and where we first fell in love with another land. Please join us in this beautiful land and it will be our great pleasure to share the wonderful places, people and experiences that we love with you. We are enjoying our best ever season with more bookings than we have ever achieved for this time of year and we are once again on track to fill all of our tours. It is also a delight for us to see 47% of our guests returning for another journey with us. 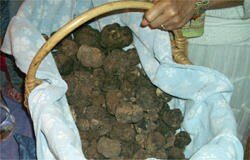 Most people have heard of the mysterious culinary delicacy known as the truffle; how it is rare, hard to find, very expensive, grows on the roots of oak, hazel and holm trees, is hunted with a pig or specially trained dog and is the cause of much skullduggery in certain winter market places in the Perigord and Provence. But what is a truffle? Simply put it is the fruiting body of a fungus similar to a mushroom that grows underground. Truffles require a moist, warm environment to allow the symbiotic relationship between the fungus ( which synthetizes minerals for the tree ) and the tree root ( which releases sugar to feed the truffle ) to occur. As a result, the success of each year's truffle harvest is subject to the vagaries of annual weather variations. There are more than a hundred different varieties of truffles growing in the wild but the vast majority only offer appeal to the creatures of the forest who enjoy eating them with gusto. For us sapien types however, there are only a few specific truffle varieties that appeal to our sense of taste ( and not all of us at that ). 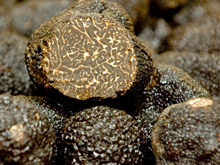 The Black truffle is renowned as the most flavoursome of all truffles and is the preferred variety used by most chefs. As a result of its strong flavour it can tolerate being heated briefly, usually in butter, before being added to enhance a dish's flavour. It has an earthy, minty, nutty flavor and is found in the Perigord, Provence, north eastern Spain and Italy from early December until early March and Australia from June to early September! It has a rough black exterior with intricate white internal veins. The Italian White Alba truffle is the most expensive variety of truffle with a smooth "felt-like" surface. 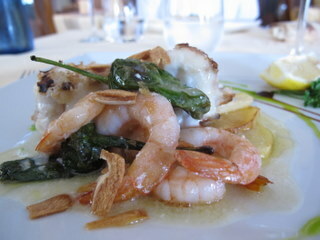 Its rarity and delicate, perishable flavour are the reason it fetches the high prices it does. It has a strong cheesy-garlic aroma and is available after mid- September. It is very important not to heat this delicate treasure, rather it should be shaved directly into the finished dish - pasta is perfect as an example - just prior to serving. The Summer Truffle is found in abundance throughout Europe, most commonly in Italy and Provence. It has a rough black exterior but an interior quite pale compared to the black truffle. It has a mild taste, reminiscent of hazelnuts. The Summer Truffle is found between May and August, and has an immense amount of flavor for its price. At this time of year in markets across Provence crowds gather, people jostle and the atmosphere is conspiratorial with whispers and surreptitious glances into baskets and plastic bags. People sniff, grunt and feel the wares before scales are produced and significant sums of money changes hands. The object of all of this activity are what appear to be small lumps of dirt - they are in fact the aromatic and highly prized Tuber melanosporum, the Truffle or "Black Diamond" of Provence which can fetch more than US$3000 per kilo! Black Truffles almost exclusively grow on the roots of oak trees in a very few regions of Provence and the Perigord. In years past, pigs were used to help find truffles because of their acute sense of smell but they have now been replaced by dogs, who unlike the pigs, are easier to handle and not hell bent on eating the prize. There is a lovely story from the Perigord about a man who found to his horror that his prize truffle pig had broken out of its pen and gone on a truffle eating spree - quelle horror! Truffles are best left in their covering dirt to help preserve them after harvest and as such they last for 3-4 days before starting to loose their aroma and flavour. During several of our Provence tours we visit a restaurant renowned in the Guinness Book of Records for producing the world's largest truffle omelete which contained 30,000 eggs! If you are not sure about all of this truffle business, a lovely way to sample the delights of the truffle at any time of the year is to make a truffle and lobster risotto. I know I am mixing my metaphors but in fact the Italians, and the Spanish for that matter, are great fans of the truffle. Fresh truffles are very seasonal and expensive but truffle infused olive oil should be available from any quality delicatessen or provender store. Remove the flesh from the lobster and slice into bite size pieces. Place the lobster shells in a pre-heated oven at 200 C and bake for 10 minutes. Fragment the shells and place them in a blender with 1 cup of chicken stock and blend thoroughly. Strain the mixture through a fine sieve or muslin cloth to remove the shell fragments, and add the resulting broth to the remaining chicken stock. Warm the combined stock in a suitable saucepan - do not allow to come to the boil. In a heavy saucepan, heat 2 tablespoons of butter until melted then add 1 tablespoon of truffle oil. Add the finely chopped onions and cook gently until translucent. Add the rice, making sure that it is well coated in the truffle/butter mixture. Slowly add the brandy, and stir continually over medium heat until it is absorbed by the rice. Add 0.5 of a cup of the warm stock to the rice and continue stirring until it is absorbed. Continue to gradually add the stock with continuous stirring - don't rush this part. The rice is cooked when it is still slightly firm and this should take a total of about 20-25 minutes. Add the lobster meat and mix well. Remove from the heat and stir through the remaining butter. Add a small drizzle of truffle oil just before serving and garnish with fresh herbs and shaved Parmesan cheese. Lobster and truffle is a combination made in heaven and a wonderful delicate dish that will really set tongues wagging at your next dinner party. During our Provence tours we will enjoy sampling summer truffles ( Tuber aestivum ) which are in season in June and July - deeelicious! 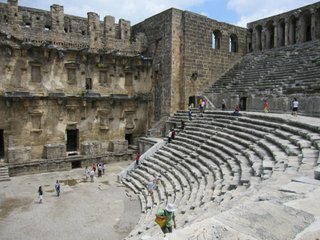 Turkey is a land of contrasts and wonder and it is very appropriate to call our journey there an Odyssey with the diversity of experiences from ancient cities to the spectacular beauty of Cappadocia, magnificent countryside, the glorious turquoise waters of the Mediterranean, sleepy seaside villages and spectacular ancient sites. 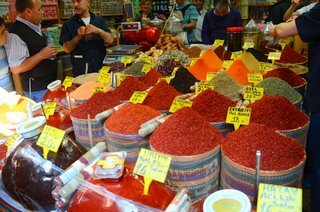 And always we have the beautiful spirit and friendliness of the Turkish people to welcome us along the way. 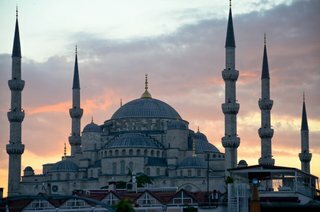 Some of the world's greatest civilizations including the Persian, Byzantine, Greek, Roman and Ottoman empires have left behind them a rich legacy of culture, architecture, art, antiquities and aromatic heritage in this place. We invite you to join us as we explore this exotic and amazing land full of breathtaking beauty and wonder.